Dr. Mark Richards of Ageless Impressions – Plastic Surgery Institute helps patients decide which non-surgical hyaluronic acid-based dermal filler would be most beneficial for their facial rejuvenation needs. Washington, D.C. – The popularity of injectables and dermal fillers continues to rise as men and women seek nonsurgical alternatives for achieving a more youthful facial appearance. 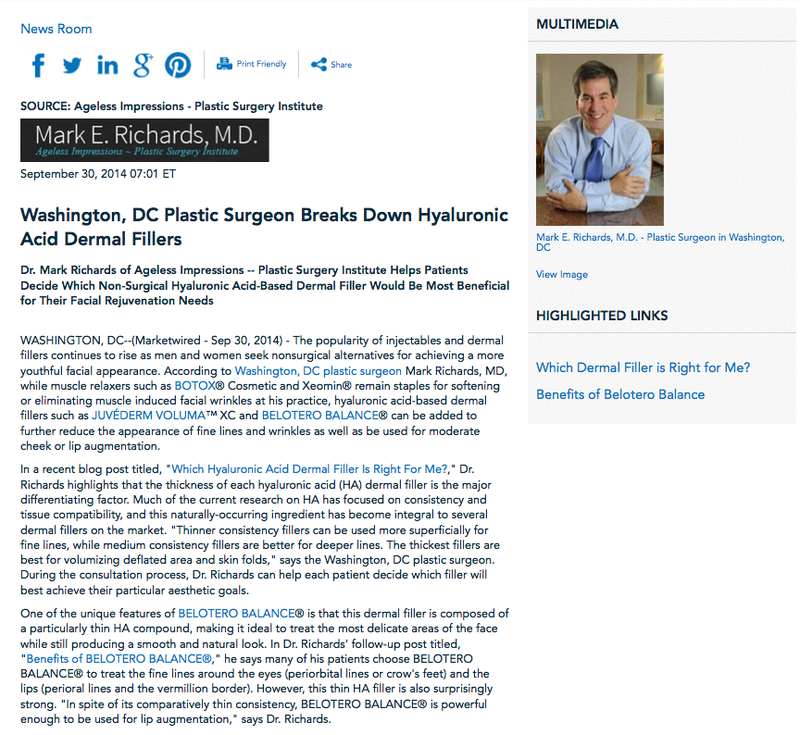 According to Washington, DC plastic surgeon Mark Richards, MD, while muscle relaxers such as BOTOX® Cosmetic and Xeomin® remain staples for softening or eliminating muscle induced facial wrinkles at his practice, hyaluronic acid-based dermal fillers such as JUVÉDERM VOLUMA™ XC and BELOTERO BALANCE® can be added to further reduce the appearance of fine lines and wrinkles as well as be used for moderate cheek or lip augmentation. In a recent blog post titled, “Which Hyaluronic Acid Dermal Filler Is Right For Me?,” Dr. Richards highlights that the thickness of each hyaluronic acid (HA) dermal filler is the major differentiating factor. Much of the current research on HA has focused on consistency and tissue compatibility, and this naturally-occurring ingredient has become integral to several dermal fillers on the market. “Thinner consistency fillers can be used more superficially for fine lines, while medium consistency fillers are better for deeper lines. The thickest fillers are best for volumizing deflated area and skin folds ,” says the Washington, DC plastic surgeon. During the consultation process, Dr. Richards can help each patient decide which filler will best achieve their particular aesthetic goals. One of the unique features of BELOTERO BALANCE® is that this dermal filler is composed of a particularly thin HA compound, making it ideal to treat the most delicate areas of the face while still producing a smooth and natural look. In Dr. Richards’ follow-up post titled, “Benefits of BELOTERO BALANCE®,” he says many of his patients choose BELOTERO BALANCE® to treat the fine lines around the eyes (periorbital lines or crow’s feet) and the lips (perioral lines and the vermillion border). However, this thin HA filler is also surprisingly strong. “In spite of its comparatively thin consistency, BELOTERO BALANCE® is powerful enough to be used for lip augmentation,” says Dr. Richards. Regardless of which dermal filler they ultimately choose, Dr. Richards strives to give all his patients a more youthful and rested look. Depending on the patient, multiple fillers can be combined for a more complete transformation. Ultimately, the Washington, DC plastic surgeon notes that the longevity of results from HA dermal fillers will vary depending on the product, specific treatment areas, and the individual patient. Results can generally be maintained with touch-up treatments. A graduate of Yale University and the University of Maryland School of Medicine, Dr. Richards has been certified by both the American Board of Plastic Surgery and the American Board of Surgery. In addition to being an active a member of the American Society of Plastic Surgeons, Dr. Richards has been elected by his peers as President of the National Capital Society of Plastic Surgeons and President of the Montgomery County Medical Society. He is available for interview upon request. To learn more about Dr. Mark Richards and his practice, visit drmarkrichards.com or facebook.com/drmarkrichards.